The circumstances of the eclipse. This month, there are two eclipses on the astronomical docket. The main event will be a total solar eclipse on March 29 that will stretch from the Atlantic coastline of Brazil, on to Africa and Turkey before coming to an end over Russia's Kazakhstan. But first it will be the Moon's turn. On Tuesday, March 14, the Moon will quietly slip into the Earth's outer shadow, known as the penumbra. Europe, Africa and the western third of Asia are in the best position to see this lunar eclipse, as it occurs high in their sky, as the night of March 14 transitions to March 15. Most of the Americas will be able to see it as well, although the eclipse will already be in progress on Tuesday evening as the Moon rises and ascends the eastern sky. In a penumbral eclipse, no part of the Moon enters the dark umbral shadow of the Earth, so no part of the Moon shows the distinct outline of the Earth's shadow. Since it will pass through the outer extremities of the Earth's shadow, this is a pale eclipse that will dim the Moon's light only slightly. That edge of the Moon passing closest to the much darker umbra may exhibit a sensible darkening. But unless about 70 percent of the Moon's disk is inside of the penumbra it is not likely to become evident to the eye. Yet, as penumbral eclipses go, this upcoming event will be a rather unusual one. Two nights before the eclipse, on March 12, the Moon will arrive at the apogee point of its orbit-its farthest distance from the Earth, 252,446-miles (406,278 km) away. So the Moon will appear nearly 7-percent smaller than average. As a result, when the Moon interacts with the Earth's shadow, it will be just small enough to become completely immersed within the penumbra, and yet will not be large enough to touch the umbra. It will be completely within the penumbral shadow for one hour beginning at 23:18 GMT (6:18 p.m. EST). According to the renowned eclipse calculator, Jean Meeus, this is only one of five such cases that will occur during the 21st century, the next one not until August 29, 2053. 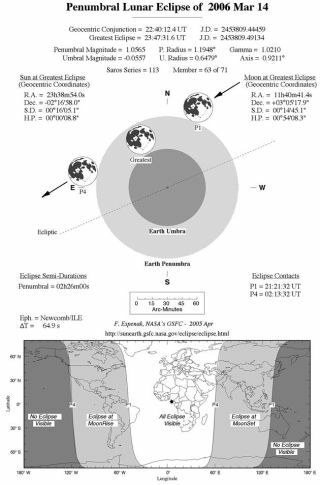 At the time of the darkest phase of the eclipse (23:48 GMT/6:48 p.m. EST), the Moon will be passing through the northern part of the Earth's penumbra, so its lowermost edge will miss touching the umbra by only 120 mi./192 km. For well over an hour before and after this time, the lowermost portion of the Moon should appear noticeably darkened by the dusky penumbral shadow, especially through binoculars and low-power telescopes. Our timetable gives the moments for the key events of the eclipse for five time zones: Greenwich, Atlantic, Eastern, Central and Mountain. For those in Europe, Africa and Asia using GMT/UT, our timetable provides the moment when the Moon will start to enter the penumbral shadow, but absolutely nothing unusual will be noticed on the lunar disk at that time. The same holds true for when the Moon leaves the penumbral shadow nearly six hours later. For North America, the Moon will have not yet risen when the eclipse begins. When the Moon first appears above the eastern horizon for the U.S. East Coast, the first subtle tarnishing of the Moon's lower left limb may begin to be perceived. Over the central United States, the darkest part of the eclipse will roughly coincide with moonrise, while the Plains and Rocky Mountain States might still catch a glimpse of the last vestige of penumbral shading. The western states, however, will see nothing visually, even though the eclipse will still officially be in progress at moonrise.